Golden: Length, 30-40 inches; wingspread, 80-88 inches; breast, dark; tail, barred. 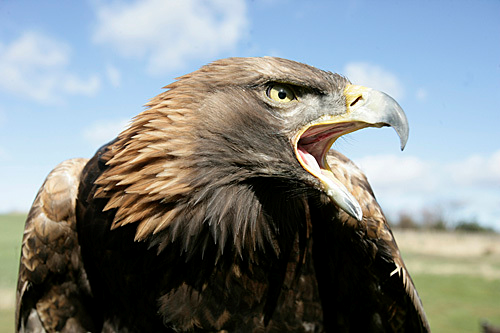 Red-tailed: Length, 22 inches; wingspread, 50 inches; breast, light; tail, light solid red. 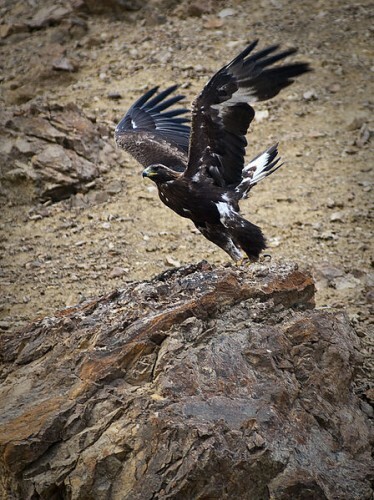 The golden eagle is around twice as large as the red-tailed hawk, so mistaking them is difficult. And as far as their habitat, you ask, don’t goldens live in the nearby mountains? They do, but as the authors of Raptors of New Mexico state, “Golden eagles are resident through much of New Mexico, from desert grasslands to mountain meadows.” And, apparently, some people’s back yards. It’s every birder’s dream for an unexpected sighting like this one.